My AVM – most of this is true. My belly button is off center. If you drew a line down the middle of my body, my belly button would be maybe a half inch to the side. It wasn’t always this way. On the opposite side, just under the scar, there’s an expanse of skin that protrudes slightly. There is always a bump there, no matter how much weight I lose. That’s just so you know: even when I’m at my thinnest, I’m a little convex. There’s a foot long scar dissecting my torso. It starts at the top of my rib cage and extends down, at a slight diagonal angle, to just below my pubic bone. They’ve opened me up there twice, and the second time the staples left little white scarred dots on either side of the pink seam. You can imagine the staples when you look at it. I remember them, like train tracks, like a zipper. Lower down I have a tiny c-section scar, almost faded away. I wish I could run my fingers over that scar and feel the same firmness, the same rigidity of the other one, because that sense memory is filled with love. The psoas is a long muscle in the lower back that flexes and contracts when you lift your leg up. It’s used for walking. When there’s something wrong with it, you feel the pain when you straighten your leg. You feel the burning all around your hip and lower back. “My hip aches,” I used to say before I knew what it was. An arteriovenous malformation occurs when the arteries and veins get tangled up and form abnormal connections. They join each other, bypassing the capillaries. The capillaries are supposed to slow everything down, remove waste from the blood, deliver nutrients to cells. The abnormal mass of arteries and veins is called a “nidus,” or nest. The high blood flow arteries connect to the slow moving veins and pressure builds. Supposedly you can hear it through a stethoscope, like a whoosh, and that’s how it is diagnosed sometimes. I imagined it pulsating, in rhythm with my throbbing pain, blood going in circles stretching the weakened veins, the tangled nest, breaking, always looking for the right off-ramp to find relief. The malformation was there from birth and grew with me. When I had reached my adult height, it was like the AVM didn’t get the message; growth accelerated. It continued to get bigger, pressing against nerves, depriving my muscle of the blood it needed to function. In the MRI you can see the mass, taking up too much space, pushing against every close structure. 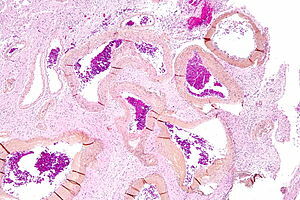 Necrosis occurs when cells die because they are not receiving enough blood. My muscle was dying, bleeding out. When they removed it, they tried to clean up, get rid of all the old blood, take out as much of the necrotic tissue as possible. There is still a lot of scar tissue. I went to a physical therapist two years ago and he could feel it when he pressed down deep under my rib cage. When I went for a CT scan they thought maybe there was an infection or a new mass in that area, but it was just leftover scar tissue. When they were still trying to diagnose me, I had to have a lot of uncomfortable and invasive procedures. The worst was a needle biopsy. They stuck a long needle into me at the base of my spine. I was awake for that one, too, although I don’t know why. The pain of that procedure was worse than almost anything. The results were inconclusive. They suggested doing it again. I refused. I had a long and painful recovery. I walked again without too much difficulty; the doctors thought maybe the other muscles in the area had been compensating for so long that the psoas wasn’t doing much of the work by that time anyway. It was harder to walk up stairs. They put a little wooden structure in the middle of the hospital hallway — three steps up, two forward, three steps down. I felt like my brain had to reconnect with my muscles. It wasn’t automatic anymore: I had to tell my muscle to lift my leg. I used a walker with tennis balls for a week. Then I used a cane again, for months. I mostly wore dresses in those days because any kind of waist band would rub against where my flesh was trying to heal and come back together. Everyone opened doors for me and got up to give me their seats. I got in ahead of every line. I’m not sure why I felt like I wanted to write this right now. My body is changing, getting stronger again, getting leaner. Most of the time, I feel good.